Britain's departure from the EU is "an historic moment from which there can be no turning back", Theresa May has said. She was speaking after Britain's EU ambassador formally triggered the two year exit process by handing a letter to EU Council President Donald Tusk. A sombre-looking Mr Tusk said it was not a "happy day" for him or the EU. The European Parliament warned security cooperation was not on the table as it fired its opening salvo in what are expected to be tough negotiations. In her letter to Mr Tusk triggering Article 50 of the Lisbon Treaty, Mrs May said failure to reach a trade deal within the two-year time limit could "weaken" cooperation in the fight against crime and terrorism. But Guy Verhofstadt, the European Parliament's chief Brexit negotiator, said he would not accept any attempt to "bargain" between trade and security, adding: "I think the security of our citizens is far too important to start a trade off from one for the other." Home Secretary Amber Rudd has said the UK could end intelligence-sharing with Europol, the EU policing agency, if there was no agreement. But in an interview with the BBC's Andrew Neil, on BBC One, Mrs May said on security that she "would like to be able to maintain the degree of co-operation on these matters that we have currently". Downing Street insisted Mrs May's comments were not intended as a threat to EU negotiators, saying it was a "simple fact" the existing arrangements would lapse if Britain left the EU without a deal. But opposition MPs accused her of jeopardising public safety by attempting to use security co-operation as a "bargaining chip" in the forthcoming negotiations. Article 50 of the Lisbon Treaty gives both sides two years to reach agreement so, unless the UK and the 27 remaining EU member states agree to extend the deadline for talks, the UK will leave on 29 March 2019, a Friday. At a press conference in Brussels, Donald Tusk held up Mrs May's letter, saying: "We already miss you." In a brief statement, he said it was not "a happy day" for him or for the EU and promised to begin arrangements for the UK's "orderly withdrawal". He said the EU's aim in negotiations was "damage limitation" and to "minimise costs" for EU citizens, businesses and member states. In a statement in the Commons, Mrs May said: "Today the government acts on the democratic will of the British people and it acts too on the clear and convincing position of this House." She added: "The Article 50 process is now under way and in accordance with the wishes of the British people the United Kingdom is leaving the European Union. "This is an historic moment from which there can be no turning back." She said Britain would now make its own decisions and its own laws and "take control of the things that matter most to us - we are going to take this opportunity to build a stronger, fairer Britain, a country that our children and grandchildren are proud to call home". She told MPs that this marks "the moment for the country to come together". Mrs May said it was a "moment of celebration for some, disappointment for others" and promised to "represent every person in the whole United Kingdom" during the negotiations - including EU nationals, whose status after Brexit has yet to be settled. She said that while the UK would remain the "best friend and neighbour" to its EU partners, it would also look beyond the borders of Europe, saying the country can "look forward with optimism and hope and to believe in the enduring power of the British spirit". "I choose to believe in Britain and that our best days lie ahead." A six-page letter from Mrs May triggering Article 50 was handed to European Council President Donald Tusk by the UK's ambassador to the EU Sir Tim Barrow. In a leaked draft position paper, the European Parliament, which has a final say over any deal struck with Britain, says Brexit could be revoked, despite opposition from the EU chief negotiator Michel Barnier to making references to the reversibility of the process. It also suggests that the European Court of Justice, the EU's top court, will be the "competent authority for the interpretation and enforcement of the withdrawal agreement". MEPs also insist that any trade deal between the UK and the EU can only be struck after Britain has left. On the shape of a likely trade deal with the EU, Mrs May told Andrew Neil: 'What we're both looking for is that comprehensive Free Trade Agreement which gives that ability to trade freely into the European single market, and for them to trade with us. "It will be a different relationship, but I think it can have the same benefits in terms of that free access to trade." German Chancellor Angela Merkel has rejected Mrs May's call for negotiations on the UK's exit from the EU to run in parallel with talks on defining their future relationship. "The negotiations must first clarify how we will disentangle our interlinked relationship... and only when this question is dealt with, can we, hopefully soon after, begin talking about our future relationship," said Mrs Merkel in Berlin. There is also likely to be a big row over outstanding debts the UK will have to pay when it leaves. Mrs May promised a "fair settlement" - the EU wants £50bn. Labour leader Jeremy Corbyn said his party would "back" Mrs May if she meets his party's tests on the Brexit deal - including full access to the single market and protection for workers' rights. Liberal Democrat leader Tim Farron, who opposes Brexit, said Mrs May was "twisting the will of the people, leaping into the abyss without any idea of where our country will end up". He said it was "still possible for the British people to stop a hard Brexit and keep us in the single market - and if they want, it is still possible for the British people to choose to remain in the European Union". "It is a tragedy that Labour are helping the Conservatives in doing this damage to our country," he added. The SNP accused Mrs May of breaking a promise to secure a UK-wide agreement before triggering Article 50 - and took a swipe at the prime minister's claim that "now is not the time" for another Scottish independence referendum. The party's foreign affairs spokesman, Alex Salmond, said: "After nine months of this prime minister's approach to Brexit Northern Ireland is deadlocked, the Welsh are alienated, Scotland is going for a referendum, the English are split down the middle, and Brexit MPs are walking out of Commons committees because they don't like home truths. "Has the prime minister considered, in terms of invoking Article 50, that 'now is not the time'?" Negotiations with other EU nations are expected to begin in mid-May. On Thursday the government is expected to publish details of its "Great Repeal Bill", which aims to convert EU law into domestic legislation and repeal the European Communities Act, which says EU law is supreme to the UK's. 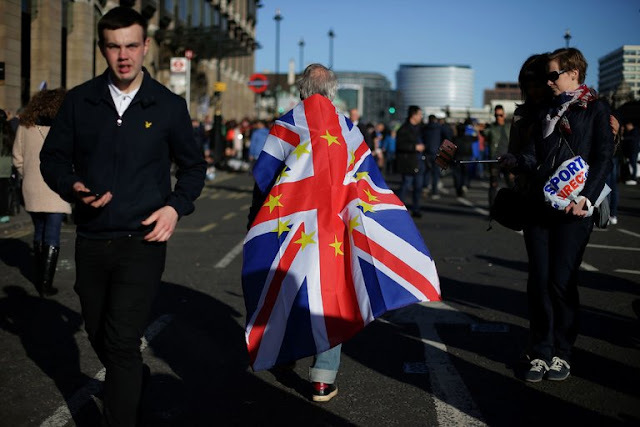 A supporter of British membership in the European Union in London on Saturday, just days before the British government officially notified the European Union of its intention to withdraw from the bloc. LONDON — In one of the most consequential diplomatic events in Britain since World War II, Prime Minister Theresa May on Wednesday sent formal notice of the country’s intention to withdraw from the European Union, starting a tortuous two-year divorce littered with pitfalls for both sides. Mrs. May said in Parliament that she was invoking Article 50 of the Lisbon Treaty, putting Britain on track to leave the European Union in 2019 and raising a host of thorny issues involved in untangling a four-decade relationship. In addition to a welter of trade and customs matters, the Conservative government faces the prospect of a new independence referendum in Scotland, where a majority voted to remain in the European Union, and deep worries about the 1998 Good Friday peace agreement in Northern Ireland. Just before 12:30 p.m., Britain’s top envoy to the European Union, Tim Barrow, walked to the office of Donald Tusk, the president of the European Council, and handed him a letter with the official notification. Mr. Tusk then posted on Twitter acknowledging receipt of the letter. With this step, Mrs. May enters what William Hague, a former foreign secretary, called “the most complex divorce ever in history.” She begins the process with limited leverage, having made clear that establishing control of immigration takes priority over membership in the European Union’s single market or customs union. As a result, analysts say, she has frequently stressed her willingness to walk away from the table if a good deal proves elusive, leaving European Union negotiators wondering whether she is serious or trying to bluff her way into a stronger negotiating position. Given her negotiating “red lines,” the difference between whatever deal Mrs. May can secure and no deal at all may turn out to be relatively small. Blaming the Europeans for a collapse of the talks might be easier, politically, than bringing a weak agreement to Parliament. The politics are so toxic, Professor Menon added, that they make a disorderly departure from the bloc — often likened to walking off a cliff edge — plausible. “It’s ugly and so frighteningly horrible, that I can’t quite believe it’s happening,” he said. European leaders have emphasized that Britain cannot “cherry pick” the rules and regulations it likes, and certainly cannot expect to have a better deal than countries that remain in the bloc. The last thing they want to do is lend greater momentum to the centrifugal forces already threatening to tear apart the European Union. What makes the looming confrontation so dangerous is that both sides stand to lose economically in the event of a breakdown. From agriculture to aviation, from fisheries to pharmaceuticals, Britain’s economy has been shaped by membership in the European Union, its main trading partner. With its single market — the world’s largest — and its customs union, the European Union ensures customs-free trade across frontiers in goods and some services. Without a deal, Britain faces customs checks at its borders and tariffs on imports and exports, not to mention the relocation of at least part of its lucrative financial services sector. But Britain is a big market for Continental Europe, too: Germany alone exports 800,000 vehicles there every year. Though London’s dominant financial services sector is hardly popular, many businesses on the Continent rely on its deep capital markets. Britain is one of only two significant military powers in the bloc — the other is France — and has valuable security and intelligence capabilities that elevate Europe on the global stage. In her letter to Mr. Tusk, Mrs. May argued that without an overall agreement, “our cooperation in the fight against crime and terrorism would be weakened.” Her officials later denied that this was a threat by Britain, arguing that it reflected the fact that some cooperation on policing issues was conducted through European Union channels. But Guy Verhofstadt, the European Parliament’s negotiator for Britain’s exit, said there could be no “trade-off” in talks between such issues and trade. “I think that the security of our citizens is far too important,” Mr. Verhofstadt said. To make matters more difficult, the final deal will require votes in perhaps 38 legislatures across Europe, as well as in the British Parliament. It is even possible that the negotiations could founder over the issue of money before they really get underway. Michel Barnier, the negotiator appointed by the European Commission, wants to resolve the terms of the departure before moving on to future trade ties. The commission estimates that Britain owes as much as $64 billion in future spending commitments and pension entitlements for European Union officials. Boris Johnson, the foreign secretary, has rejected that idea, invoking the memory of Prime Minister Margaret Thatcher, who in 1984 demanded — and received — her “money back” from European partners in another acrimonious negotiation. Diplomats say a collapse over money matters can be avoided if specifics are left until the end of the talks, when the parameters of a trade deal are known. European officials seem open to that idea of reaching agreement on the principles and methodology of calculating what Britain owes, based on commitments undertaken while it was a member. That would allow Mrs. May to justify payments as part of a deal allowing continued access to European markets. Joachim Fritz-Vannahme, director of the Europe program at the Bertelsmann Foundation, a research institute based in Germany, said the best prospect of achieving agreement was a broad discussion, including defense and security cooperation, an area where London has something to offer at a time when NATO’s role is being questioned. He said he believed one danger was the “illusion” among some in Brussels that the European Union was “strong enough to live without the Brits,” who still have significant economic and military power. Another is the illusion among some Britons that they can dictate the terms of a deal. Professor Menon, too, said he thought the messages from some British politicians, reinforced by tabloid newspapers aggressively for the exit, were destructive. “The British people now think that Europeans will be stupid if they don’t give us a good deal, because it’s in their own interest,” he said. Time will be a problem, too. British businesses want a transition period to adapt to the circumstances after withdrawal, but this requires an agreement on what Britain would transition to after 2019. And unless all this is decided quickly, it will be of little use; companies will not be able to wait long into 2018 before assuming the worst outcome and acting accordingly, even if that means a sharp economic adjustment. The government will set out how it plans to remove EU law from the statute book later by publishing details of its Great Repeal Bill. Having formally triggered Brexit, ministers are promising a "smooth and stable transition" with legislation ending the supremacy of EU judges. It will also incorporate thousands of pieces of EU law into UK legislation. The publication comes the day after the UK started two years of talks using Article 50 of the Lisbon Treaty. Prime Minister Theresa May described the invoking of Article 50 as a "historic moment from which there can be no turning back", saying Britain would now make its own decisions and its own laws. Key to this pledge is the Great Repeal Bill, which ministers say is essential to avoid a "black hole" in the law when the UK leaves the EU. The UK Parliament can then "amend, repeal and improve" the laws as necessary, the government says. However, it could prove controversial with plans to give ministers the power to make changes to some laws without full Parliamentary scrutiny. The government says this will only be for "mechanical changes" to ensure laws function properly. The Commons library anticipates it will be "one of the largest legislative projects ever undertaken in the UK"
Brexit Secretary David Davis said: "At the heart of the referendum decision was sovereignty. A strong, independent country needs control of its own laws. That process starts now. "Converting EU law into UK law, and ending the supremacy of lawmakers in Brussels, is an important step in giving businesses, workers and consumers the certainty they need." The TUC urged the government to ensure the repeal bill was used to maintain all existing EU workers' protections. Article 50 of the Lisbon Treaty gives both sides two years to reach agreement so, unless the UK and the 27 remaining EU member states agree to extend the deadline for talks, the UK will leave on 29 March 2019. It was invoked through a six-page letter from Mrs May to EU Council president Donald Tusk, promising the UK would remain "committed partners and allies". The PM called for a "deep and special partnership that takes in both economic and security cooperation", and also warned the failure to reach a deal could weaken the joint fight against crime and terrorism. In response, Guy Verhofstadt, the European Parliament's chief Brexit negotiator, said he would not accept any attempt to "bargain" between trade and security. Mr Tusk, who told the UK "we already miss you" as he received Mrs May's letter, is expected to set out the EU's draft negotiating principles in the coming days. In a brief statement on Wednesday, he said it was not "a happy day" for him or for the EU and promised to begin arrangements for the UK's "orderly withdrawal". The EU's formal negotiating position will be agreed only at a summit of the remaining 27 member states at the end of April, meaning face-to-face discussions are unlikely until May or early June. Early issues are likely to include the rights of expats in the UK and the rest of the EU, the size of any severance payment required of the UK and whether talks on a new trade deal can be handled at the same time as the Article 50 negotiations. In a BBC interview after her Commons statement, Mrs May insisted the UK could keep "the same benefits" in terms of trade despite leaving the EU single market. Labour's Jeremy Corbyn said his party would be holding the government to account "all the way through", promising to "speak for the entire country". 0 Response to "'No turning back' on Brexit as Article 50 triggered"